The hip is a ball and socket joint composed of the head of the femur and the acetabulum of the hip. Like all joints of the body, the hip is susceptible to arthritis and its associated symptoms. Age-related arthritis that develops due to naturally occurring processes in the body. As seen in the illustration above, osteoarthritis wears done cartilage that covers and protects the bone. As wearing increases, painful bone-on-bone rubbing occurs. Post-traumatic arthritis. Accidents or injuries can damage the bone and cartilage of the hip joint and cause early onset arthritis. Patients who sustain hip fractures are especially susceptible to post-traumatic arthritis. Rheumatoid arthritis. An autoimmune disorder known as rheumatoid arthritis causes chronic inflammation that disrupts the integrity of the joint. Patients with this condition experience arthritis to differing degrees. While the condition can be treated using medications prescribed by a rheumatologist, a hip replacement is necessary in severe cases. 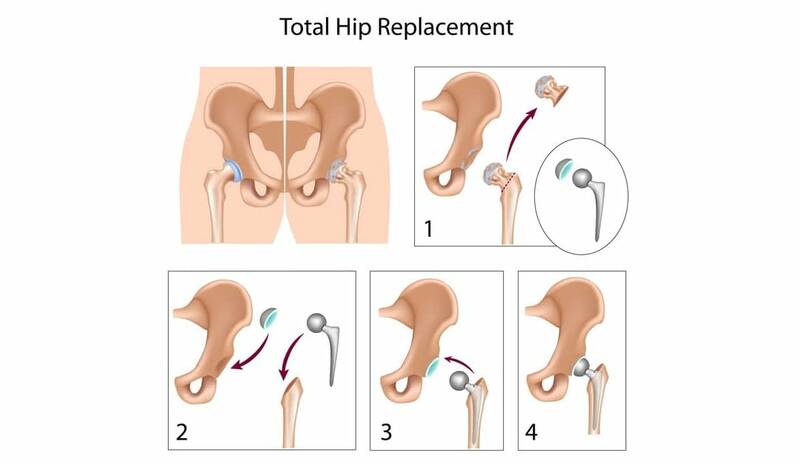 A total hip replacement replaces the head of the femur and acetabulum of the hip with metal and plastic components. The procedure is performed under general anesthesia and takes 1-2 hours. Following surgery, the patient remains in the hospital for 2-3 days. Physical therapy is a big part of the recovery process. In most cases, it’s started the day of or the day after surgery. Once the patient is discharged from the hospital, home therapy sessions last until the first visit with the operating surgeon (usually 2 weeks after the procedure). Therapy can be continued on an outpatient basis, as determined by the operating surgeon, until the patient has made a full recovery, usually around the 6 month mark. Patient satisfaction following a total hip replacement is high. The symptoms of arthritis are reduced (or eliminated) and the patient is able to return to a normal, fully functional life. Some restrictions may be put in place, but that’s a decision that’s made by the operating surgeon. Orthopedic surgeons are the only medical professionals who have been trained to perform total hip replacements. If you can relate to the information in this post, please give us a call to arrange an appointment with one of our specialists. They will evaluate your hip and come up with a treatment plan that’s right for you. You’ll be on the road to recovery and can look forward to living a long and happy life. High Mountain Orthopedics specializes in Joint Replacement Procedures and is New Jersey’s leading joint replacement experts. Dr. William Matarese Dr. Tony Wanich and Dr. Sherwin Su have over 25 years of combined and utilizes the latest advancements in Minimally Invasive and Arthroscopic procedures to expedite the healing process. We are also one of the only practices in New Jersey utilizing advanced Makoplasty procedures for joint replacement. If you are considering a hip replacement – contact our offices today! We have locations in Wayne, Clifton and Englewood, NJ.